For every 100 families in poverty in 2014, only 23 received cash benefits from TANF. That’s down from the 68 families for every 100 in poverty that received cash assistance when TANF was first enacted in 1996. 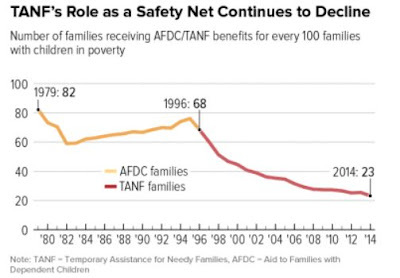 This TANF-to-poverty ratio has fallen nearly every year since 1996, and it’s now at an all-time low . The national TPR highlights how the cash safety net for families has weakened since TANF’s creation, but it tells only part of the story. The ratio varies widely among states, ranging from a low of 4 to a high of 78. In 12 states, the ratio is 10 or less, meaning that for every 100 families living in poverty, 10 or fewer receive TANF cash assistance. Some conservative policymakers tout the success of 1996’s welfare reform — of which TANF’s creation was the cornerstone — and hold TANF up as a model for other programs. With TANF, federal policymakers gave the states responsibility for providing a safety net for families in need. Progressive Review: TANF was part of Bill Clinton's disastrous welfare reform for which Democrats have yet to take responsibility. As Diana Spatz wrote in the Nation in 2011: "In passing TANF, Congress and Bill Clinton made good on their promise to 'end welfare as we know it.' It’s time to end welfare reform as we know it instead."